"It is true that there is plenty of material in the Koran that is more egalitarian than the western Christian tradition, which was heavily influenced by the misogyny of Greek thought. Perhaps the most fundamental is that the Islamic God does not have a gender. Arabic may refer to him by use of the male pronoun, but he is never described as "father" or "lord" as he is in the Judaeo-Christian tradition. Indeed, the Islamic God has characteristics that are expressly feminine; one of his most important "names" is al-Rahman (the All-Compassionate) from the Arabic rahma , which comes from the word rahim , meaning womb. In Islamic mysticism, the divinely beloved is female." "According to the Qur'�n, the names All�h and Rahm�n are quasi-equivalent: "Call Him All�h or call Him Rahm�n, to Him belong the most beautiful names"; which indicates the as it were Shaktic character of the name Rahm�n. The name Rah�m, 'Merciful', in a way prolongs the name Rahm�n, 'Gracious'; it prolongs it in view of the creatures, and in this sense it is taught that Allah, who is Rahm�n in His Substance, is Rah�m in relation to creation. The great Shakti in Islam is the rahmah: it is the Goodness, Beauty, and Beatitude of Allah. (Note that in Arabic the word rahmah is derived from the root rahim, a word signifying 'womb', and this corroborates the interpretation of the rahmah as Divine Femininity, thus as mah�shakti.)" "We have people from all kinds of races, all kinds of religions, all kind of nationalities, all kinds of political systems. But there is such a beautiful brotherhood and sisterhood among them. Without any effort it has been achieved. Automatically, they have become so beautiful because there is between ourselves and the Reality a very little distance. If we can cover that distance and if we could absorb the Reality, then you'll be amazed how you are so fantastic, so glorious, so wonderful. If we see the world, we have all kinds of problems - ecological problems, political problems, economic problems, family problems, all kinds of problems. But the centre point of all these problems is one that's the human being. And if somehow we can transform this human being into a new awareness of universality, then all these problems can be solved. As we had saints in our country and as we had great philosophers in so many countries, all of them have talked about the Spirit. All the scriptures also have talked about becoming the Spirit. But in reality, all these religions which were very great, which were very pure, were absolutely real, got into a mess because people who followed them were either money-oriented or power-oriented. They were never Spirit-oriented. They never bothered as to how to achieve this ascent. Take the example of Buddha, Mahavira. Both of them did not even want to talk of God Almighty because they though if you start talking about God Almighty, people just start thinking they belong to this religion, that religion. "So let us talk about something which is formless." That is the Spirit and they insisted that you should have your Self-Realization. Without Self-Realization, they did not want to talk about anything. Same with Mohammed-sahib, Nanak-sahib; they all talked about the Formless Divinity, reason being the same. But whether you talk of the form or the formless, it is a talk. Like if you talk about the flowers, you don't get the honey. And if you also talk of the honey, you don't get the honey. Talks are talks. These are words. In Sanskrit Adi Shankaracharya called this as Shabda Jalam, is the web of the words. How to go beyond the web of the words? Of course, Kundalini awakening is not a new thing in this country. Sahaja Yoga also is not a new thing. And it has been expressed in all the scriptures that unless and until you become the Spirit, unless and until you are reborn, you cannot know the religion. That doesn't mean you know it by your mental efforts. Mentally, everybody knows what is their religion is or what is their philosophy is. Everybody knows mentally, but, as you see recently I was shocked to hear so many people, Armenians killed Azerbaijans because they're Muslims. But before going to kill them, they used to read the Bible. How can it be? Just imagine Christians doing that. If you read also about Islam, it's one of the best religions, is so beautiful, so good, but nobody has understood what Mohammed Sahib has said. That you have to know it. Now the know word comes from the word gna, as in Sanskrit means to know - gna. Early Christians were called as Gnostics because they knew. Knew means to know on your central nervous system - not to know mentally, but to know on your central nervous system. That's why when as soon as this Paul took over, Christ's disciples ran away and when Thomas came to India he hid all the Knowledge about Reality in a jar in Egypt and then he came down. Why? Because he would have been persecuted by people who were interested in organizing religion, in making money out of it. As a result of all this nonsense, people said better not talk of religion. If you talk of religion, that means there is a quarrel, there's a fight, there's "I belong to this religion, you belong to that religion, so let us fight." As if religion means you have to fight; killing people, murdering people - how can it be a religious act? Impossible! But it has become because human beings are like that. They can make a mess of everything, if you allow them and, if they have made a mess of this, I am not surprised the way they have been killing people. They have been making money; they have been smuggling things. I mean, all sorts of things which thugs and [-] won't do, they are doing in the name of God. But that does not mean there is no divinity, there is no Reality." By doing all this have they achieved their Self-Realization? Have they attained their Qiyamah and have they found the Truth? Nothing of the kind has happened to them. They are diverting the attention of people to wrong things and are trying to do something which is absolutely no good for the peace of the world. It is because of them that there are little wars going on in so many places. . . . These religions inject fixed ideas into the brains of people. These fixed ideas start developing in a collective way and this can produce a very big, collective monster which can believe only in killing others and pushing its own ideas." "All the living processes we accept blindfolded and we are not at all concerned as to know how: how these flowers have come out of the Mother Earth? how their heights are maintained? how their colours are reproduced from a small little seed? All this comes to us because we do not know about it. But this All-Pervading Power, which they are talking about Pure Love, that Pure Love is One; that Energy that does all these beautiful, delicate things. Once you are connected with that, your Spirit gets enlightened. In the sense it is an enlightenment, but it enlightens your attention. As your attention enlightens, you become a different personality altogether. First of all, you become collectively conscious means you know about others also. You know about your own centres on your fingertips. Also you know about others, their subtle centres, what is their problem. Now, these centres are the ones which are the foundations of our physical, mental, emotional and spiritual being. When you put these centres right, you are all right. That's how you know here in Delhi we have two doctors and third one is coming up, who have got their M.D. in cures of Sahaja Yoga. Many diseases which are suppose to be incurable can be easily cured in Sahaja Yoga because when this Kundalini, when She passes through these six centres, She enlightens those centres, nourishes those centres and integrates them, so in totality you are all right. it's not like that one part of the body is treated, another is neglected. In totality, in the whole balance and She puts you in the central path of balance. Of course, with this Light, you become definitely a very wise person because your mind, you can empty it at any time, which we call as thoughtless awareness. At that time you become absolutely peaceful. After little working out, this connection, when it is established well, then you become a person which we call as full of doubtless awareness. Means you become so powerful that you can give Realization to others, you can cure people, you can talk about Sahaja Yoga as your own Knowledge. it's true, I have guided whenever they have asked questions and things about it, but much has come from within and the enlightenment has told them that these scriptures are very different from the way the people are following them. They can now see the enlightenment of these great souls who came on this Earth to help us. So in the evolutionary process now, we are just standing at the edge of our last breakthrough and that is Self-Realization and the whole world has to get it. Of course, I don't know if the whole world will get it or not but the way it is moving in Sahaja Yoga in thousands and thousands and thousands everywhere, I feel that lots of people in My lifetime only will get Realization. Not only that, but they will form that beautiful society which doesn't fight, which doesn't have violence, which is not cheating, which is not ambitious, which is not quarrelling with each other, which doesn't talk ill of others, which doesn't cut each other's throat. These ideas do not come into their head. They're extremely moral. They don't look at other women. They do not trouble their children. They are the most law-abiding people automatically. I don't have to tell them, "Don't do. Don't do." All their bad habits drop out." 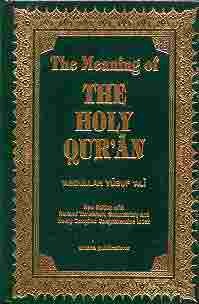 "Besides the teachings in Allah's Word, and the teaching in Allah's world, of nature and history and human contacts, many Signs come to the men of God, which they humbly receive and try to understand; and many Signs also come to the ungodly, in the shape of warnings or otherwise, which the ungodly either do not heed, or deliberately reject. The Signs in the two cases are not the same, and that becomes one of their perverse arguments against faith. But Allah's working will be according to His own Will and Plan, and not according to the wishes or whims of the ungodly."